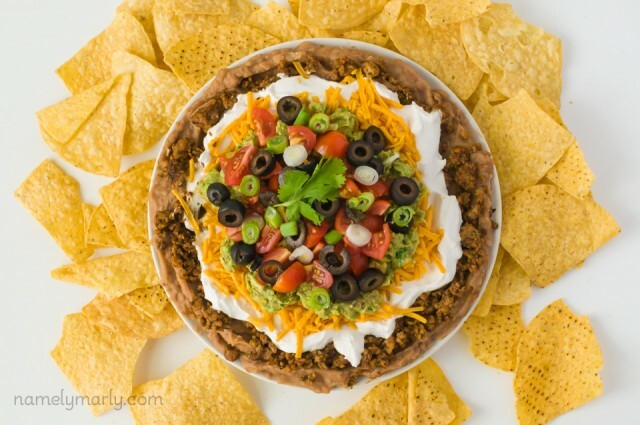 Mexican Layered Vegan 7-Layer Dip is an easy dip recipe perfect for parties. 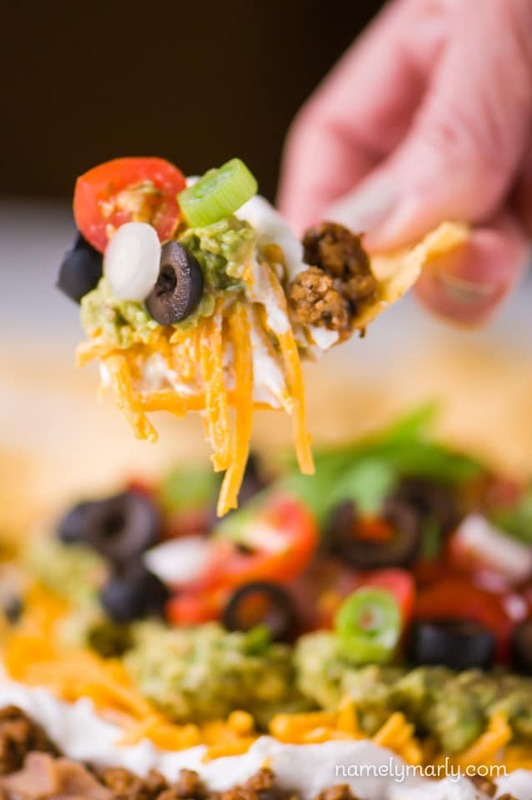 Seven Layer Dip is made with minimal ingredients, with a bean dip base topped with guacamole, sour cream, cheddar cheese, salsa, and more. This easy layered taco dip recipe is serve with tortilla chips or corn chips. See tips for making this vegetarian dip gluten-free as well. There are all kinds of fiestas in this word. There’s the Fiesta Bowl. The Ford Fiesta. Fiesta Casinos. Oh, and there’s the Fiesta Familia! Yes, our family fiesta. That happens just about any time we fix this completely delicious, utterly addictive Vegan 7-Layer Dip. Vegans, vegetarians, and and omnivores alike dive into this Vegan 7-Layer Dip because each layer of flavor is delicious and there are seven of them! It’s ridiculously good! Mostly we make this dip for parties. But every now and then we’ll just make it to have here at home. And when we do? I dine on nothing but 7-Layer Dip for days. It’s heavenly. As you can see from the recipe below, this is really more of a 8 or 10 layer dip, depending on how you want to define a layer. I think 7 just has a much nicer ring to it, so I’m going with that. This vegan 7 layer dip is relatively easy to make. Simply spread fat-free refried beans in the bottom of your serving dish and then top it with layers in this order: seasoned veggie crumbles, vegan sour cream, vegan cheese, guacamole, chopped tomatoes and more. Of course, if you’re like me and prefer things extra spicy, then be sure and have some hot sauce on the side! How long does Seven Layer Dip last in the refrigerator? Cover your seven-layer dip with plastic wrap or keep in a sealed container. When properly stored, it should last up to 4 days in the fridge. Some people like to serve seven Layer Dip baked. That’s referred to as Hot Seven Layer Dip. To do this, layer the vegetarian refried beans on the bottom, topped by the seasoned veggie crumbles, and then topped with the cheese. Bake this in an oven at 375F° for about 15 – 20 minutes, until the beans are hot and the cheese has melted. Then remove from the oven and add the remaining layers of toppings. Can you make 7 Layer Dip the night before? You can easily make this layered dip the night before a big event, as the flavor gets better as it sits overnight. This bean dip is best when served within 24 hours of being made. Can you make Seven Layer Dip without guacamole? You can make this taco dip without guacamole. Then it would be a 6 Layer Dip! You could always find another layer to add, like maybe some vegan cream cheese combined with salsa. Either way it’s a perfect chip dip for watching football! This Vegan 7-Layer Dip is going to find its way to your heart because it’s so easy to throw together and no one will guess it’s vegan! Stir vegan sour cream (and consider adding a little plant-based milk if it’s super thick). Then carefully spread sour cream across top of veggie crumbles. That completes your seven layers, but it’s not “really” complete until you garnish it with a sprinkling of chopped tomatoes and green onions. This part is completely optional, but highly recommended. We serve it right away, but you it’s also good after having been stored in the fridge. Tortilla chips not calculated in nutrition information. 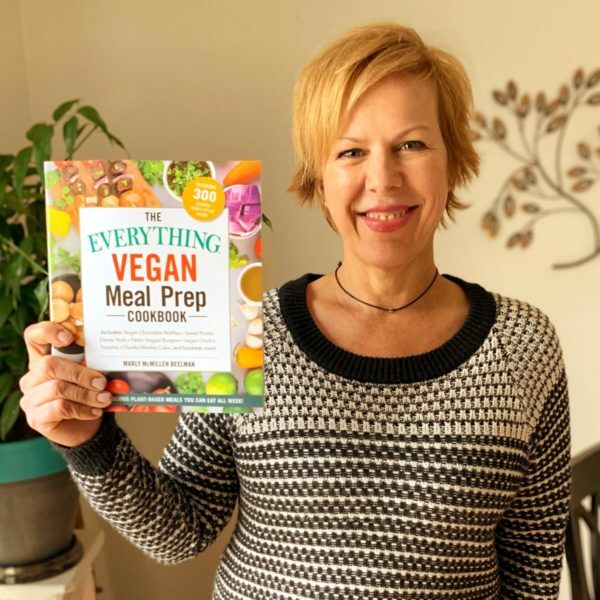 You can skip the first few steps by buying veggie crumbles that are flavored with southwest or taco seasoning (such as Beyond Beef Spicy Veggie Crumbles). If you’re into Mexican dip, you might like some other taco dips, such as my Easy Vegan Queso Dip. This recipe requires only a few ingredients and a few minutes to throw together! Easy Vegan Queso Dip. That’s right – less than 10 ingredients and 10 minutes makes it SO easy! Then there’s my Vegan Taco Dip. It’s super easy and oh so delicious! This Vegan Taco Dip is so good, you’ll want to make it again and again! Top it witch chopped cherry tomatoes or fresh salsa! Whatever dip you’re noshing on, enjoy! p.s. hope you’ve seen that ‘double rainbow’ guy on YouTube, otherwise, my first statement probably seems pretty weird! Is there anything better than seven layer dip at a party? I can imagine eating at least 1/4 of this delicious looking appetizer (with a lot of chips!) This is one of Ryan’s favorite treats, and I love this vegan adaptation! Anything with guac makes me happy! That looks insanely delicious Marly! I would have no problem eating that for days! Wow super simple and so colourful!! This 7 layer dips is making me seriously hungry!!! 1. What are soy crumbles? ?…I don’t live in the US and we don’t have a lot of vegetarian substitutes here. Would that be a substitute for ground meat? 2. How much (weight wise) is in a package of soy crumbles that you use? Also, if you needed an alternative, you could also use TVP. We use this sometimes in recipes that call for ground beef. If your local health food stores don’t have Boca, maybe they might have TVP. http://en.wikipedia.org/wiki/Textured_vegetable_protein. Huge hit! Made it for a party and everyone loved it!